There is no evidence that humans arrived on Crete before 6500–6000 BC. By 3000 BC, however, the Minoan civilization - a Bronze Age culture named for the legendary ruler Minos - was emerging. In its first centuries this culture produced little more than circular vaulted tombs and some fine carved stone vases, but by about 2000 the Minoans had begun to build “palaces” on the sites of Knossós, Phaestus, and Mallia (Mália). The Minoan civilization was centred at Knossós and reached its peak in the 16th century BC, trading widely in the eastern Mediterranean. The Minoans produced striking sculpture, frescoes, pottery, and metalwork. By about 1500 BC, Greek mainlanders from Mycenae had assumed an influential role in Minoan affairs. After Crete suffered a major earthquake that destroyed Knossós and other centres about 1450 BC, power in the region passed decisively to the Mycenaeans, with whom Crete was closely associated until the commencement of the Iron Age in 1200 BC. About this time the Dorians, another Greek-speaking people, moved in and organized the island. Crete played a supporting role in the revival of Greek civilization that began in the 9th century BC, and during Athens's heyday in the 5th century BC, Crete fascinated the Greeks as a source of myths, legends, and laws. By 67 BC the Romans appeared and completed their conquest of Crete by converting it into Cyrenaica, a province linked with North Africa. In AD 395 the island passed to Byzantium (the Eastern Roman Empire), and the Arabs gained control over parts of Crete after 824 but lost them back to the Byzantines in 961. In 1204, in the aftermath of the Fourth Crusade, crusaders sold the island to Venice, which fitted Crete into its growing commercial empire. The native Cretans, however, never abandoned their Orthodox religion, Greek language, and popular lore. The Ottoman Turks, who were already in control of parts of Crete, wrested the capital city of Candia (now Iráklion) from the Venetians in 1669 after one of the longest sieges in history. Crete stagnated under Turkish rule, and native uprisings were always foiled, including those in 1821 and 1866. The Turks were finally expelled by Greece in 1898, after which the island held autonomous status until its union with Greece in 1913. Bronze Age civilization of Crete that flourished from about 3000 BC to about 1100 BC. Its name derives from Minos, either a dynastic title or the name of a particular ruler of Crete who has a place in Greek legend. A brief treatment of Minoan civilization follows. Crete became the foremost site of Bronze Age culture in the Aegean Sea, and in fact it was the first centre of high civilization in that area, beginning at the end of the 3rd millennium BC. Reaching its peak about 1600 BC and the later 15th century, Minoan civilization was remarkable for its great cities and palaces, its extended trade throughout the Levant and beyond, and its use of writing. Its sophisticated art included elaborate seals, pottery (especially the famous Kamáres ware with its light-on-dark style of decoration), and, above all, delicate, vibrant frescoes found on palace walls. These frescoes display both secular and religious scenes, such as magical gardens, monkeys, and wild goats or fancifully dressed goddesses that testify to the Minoans' predominantly matriarchal religion. Among the most familiar motifs of Minoan art are the snake, symbol of the goddess, and the bull; the ritual of bull-leaping, found, for example, on cult vases, seems to have had a religious or magical basis. The capital of the legendary king Minos, and the principal centre of the Minoan, the earliest of the Aegean civilizations. The site of Knossos stands on a knoll between the confluence of two streams and is located about 5 miles (8 km) inland from Crete's northern coast. 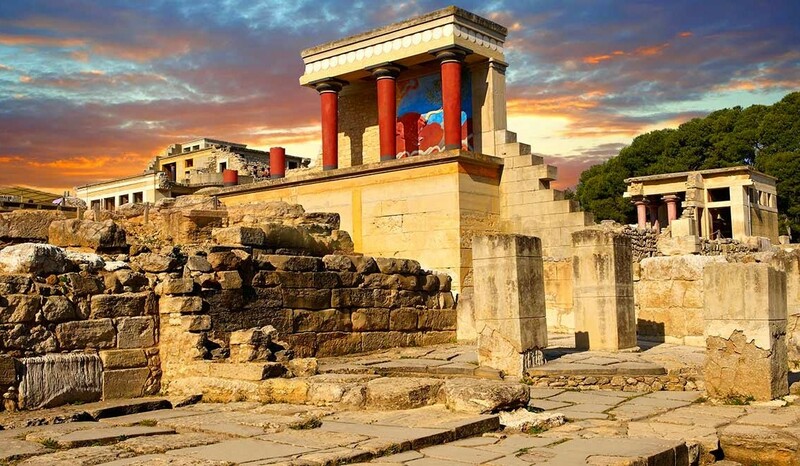 Excavations were begun at Knossos under Sir Arthur Evans in 1900 and revealed a palace and surrounding buildings that were the centre of a sophisticated Bronze Age culture that dominated the Aegean between about 1600 and 1400 BC. The first human inhabitants of Knossos probably came there from Anatolia in the 7th millennium BC and established an agricultural society based on wheat and livestock raising. At the beginning of the Early Minoan period (3000–2000 BC) they began using bronze and making glazed pottery, engraved seals, and gold jewelry. A hieroglyphic script was invented, and trade with the Egyptians was undertaken. The first palace at Knossos was built at the beginning of the Middle Minoan period (2000–1580 BC). It consisted of isolated structures built around a rectangular court. Knossos produced fine polychrome pottery on a black glazed ground during this period. About 1720 BC a destructive earthquake leveled most of Knossos. The palace was rebuilt, this time with extensive colonnades and flights of stairs connecting the different buildings on the hilly site. The remains of this palace occupy the excavated site in the present day. The administrative and ceremonial quarters of the palace were on the west side of the central court, and the throne room in this area still contains the gypsum chair in which sat the kings of Knossos. This area of the palace also had long narrow basement rooms that served as storage magazines for wheat, oil, and treasure. Workshops were located on the northeast side of the central court, while residences were situated in the southeastern section. An elaborate system of drains, conduits, and pipes provided water and sanitation for the palace, and the whole urban complex was connected to other Cretan towns and ports by paved roads. The art of Minoan fresco painting reached its zenith at this time, with scenes of dancing, sports, and dolphins done in a naturalistic style. The Minoans also replaced their hieroglyphic script with a linear script known as Linear A. About 1580 BC Minoan culture and influence began to be extended to mainland Greece, where it was further developed and emerged as the culture known as Mycenaean. The Mycenaeans, in turn, achieved control over Knossos sometime in the 15th century BC; the Linear A script was replaced by another script, Linear B, which is identical to that used at Mycenae and is most generally deemed the prototype of Greek. Detailed administrative records in Linear B found at Knossos indicate that at this time the city's Mycenaean rulers controlled much of central and western Crete. Tip: Don't forget to visit the archaeological museum in Heraklion, ideally before your visit to Knossos as most of the foundings are there. A great small museum if you are on the other side of the island to visit is the one in Eleftherna which can be combined with a nice cycling route.